The impact of DCM on the success and profitability of the modern product development organization. The influence of DCM on major functional activities, including product concept, product design, information systems, quality management, and many other areas. The major challenges faced in implementing a design chain management strategy, as well as approaches for meeting these challenges. 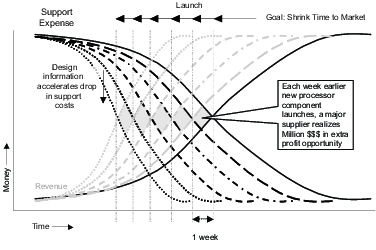 Contemporary product development is a fairly linear process, see figure 1.1. On one side are the suppliers that provide parts needed by their customers, as well as data sheets about those parts. This information is typically contained in data sheets or data books that are updated by the supplier in more or less regular intervals. On the other side are the product development organizations that utilize the parts offered by a supplier to create larger systems. To facilitate the engineering process, product development engineers use the data sheet information provided by the supplier to make design decisions for the system to be delivered. One of the ramifications of the one-directional transfer is that it has limited the supplier and customer to implement time-to-market (TTM) improvements within their organizations only. Independently, supplier and customer have improved their processes for turning out products faster and better. The strategies employed by either product development organization appear similar. 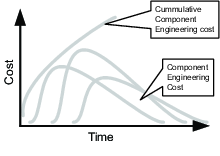 Where existing processes were carried out in sequence, concurrent engineering approaches have reduced product development times. 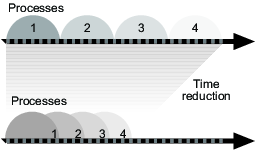 Figure 1.2 shows how individual process steps can be overlapped to reduce the overall product development time. Typically, this involves integrating multiple CAD systems and tools. These systems are themselves frameworks that were developed with no anticipation of subsequent integration. To illustrate some of the issues, consider the team depicted in figure 1.3. At any instant, team members may be working at different levels of detail, each employing his or her own representations of physical artifacts, engineering models, and knowledge. For example, the Layout Engineer is primarily concerned with the geometry of a device and its configuration space, while the Conceptual Engineer in constructing an entire product that fits into the cost budget and fulfills the desired functionality and behavior of the final product. At the same time the Electrical Engineer needs model information about the parts that make up the system. Despite their differences in perspective, the specialists share considerable information. Traditionally, in applying information technologies to support product development processes, tools are implemented that will help the team members to share knowledge and keep track of each othersâ needs, constraints, decisions, and assumptions. Nonetheless, projects that involve large segments of an enterprise or multiple enterprises will collaborate on engineering activities that take place within an individual framework to achieve the process improvements and time reductions. The drawback of these approaches for product development organizations is that they focus on improving the internal product development only. Involvement of suppliers or customers is not part of this integration. Interestingly, contemporary computer aided design and engineering design tools appear to exacerbate the problems that concurrent engineering approaches are trying to solve. Most tools provide point solutions, to particular modeling and analysis problems, based on idiosyncratic representations and algorithms. Designers are frequently frustrated because these tools are developed by and for expert users with little attention given to the simplification of the design chain. Effective use requires knowledge of the conventions, the decisions, and other characteristics or limitations of the approach. The design chain is rarely obvious from the CAD tools and must be absorbed by wading through extensive documentation and consulting with the toolsâ developers and frequent users. Worse still, idiosyncratic design tools contribute to the isolation of designers by preventing them from sharing their design models. For example, from the electronic component development and system design chain: â…deeper collaboration with downstream design chain partners is needed more than ever as design complexity increases and performance requirements become more challenging. These facets of the modern design process point to a new topology of the design chain, from the semiconductor component manufacturers to the Original Equipment Manufacturers (OEMs), which must be capable of delivering the volume-ramped product into the market rapidly before the competition.â As a result of these realities, design organizations now find it is time to look beyond just time managing their own internal development processes. From this realization emerged the concept of a âdesign chainâ. The design chain encompasses all the activities associated with the flow and transformation of information from the supplier through to the customer (typically the end user), as well as the associated information flows. Design chain management is the integration of these activities through design chain relationships, to achieve a sustainable competitive advantage. With the emergence of low-cost desktop-computer systems, hand held devices, high-speed networks, and the Internet, the cost and availability of information resources allows easy linkages and eliminates information-related time delays in any design chain. This means that organizations are moving toward a concept known as Electronic Commerce, where transactions are completed via a variety of electronic media, including electronic data interchange (EDI), CD-ROM catalogs, business-to-business (B2B) transactions, and a variety of others. This means that the old âpaperâ type transactions are becoming increasingly obsolete. All information is recorded electronically, and associated transactions are performed with a minimum amount of human intervention. The proliferation of new telecommunications and computer technology has also made real-time, on-line communications throughout the entire design chain a reality. New systems that link suppliers, manufacturers, distributors, and ultimately customers (regardless of their location) are emerging. These technologies are âenablersâ, in that they can substantially reduce paperwork, improve communication, and reduce lead time if properly implemented. A second major trend facing organizations today is the demand for ever-greater levels of responsiveness and shorter defined cycle times for higher quality information. A variety of changes occurring throughout global markets have resulted in an increasingly competitive environment. The rate of change in markets, products, technology, and competitors occurs at an increasingly rapid pace, leading to a condition in which managers must make decisions on shorter notice, with less information, and with higher penalty costs. At the same time customers are demanding quicker delivery responsiveness. These same customers require information that incorporate state-of-the-art technology and features. Availability of information and content is fragmented, and customers are demanding options that are tailored to their unique requirements. Managers throughout the product development design chain are feeling the full effect of these changes. Outsourcing and cutbacks in staffing are forcing managers to handle a greater number of product features with fewer people, while cost pressures require that they do so with less iterations. Because of the ever-increasing levels of competition found in many markets, product development design chain related mistakes are leading to lost revenues. Furthermore, both customers and suppliers are becoming increasingly aware that measuring performance along the inter- organizational design chain is a key factor to detect shortcomings in product development. All product development organizations are managed with particular attention to time. A reduction in the time it takes to develop a product is directly linked to profits. Clearly, reductions in development time have enabled competitors in the same industries to grow faster, earn higher profits and increase market share through the early introduction of new products. Resource allocation plays a pivotal role in this scheme. In product development organizations with relatively little communication across boundaries, resource allocation is a more or less static process, because resources rarely shift between projects. This leads to a point at which the quality of results of the product development organizations is directly linked to time. Further pressures on time at this point of equilibrium will have a direct impact on the resulting product quality. In contrast, product development groups that take advantage of knowledge (information) generated from all areas of inter-organizational communication, are significantly more productive than their rivals. The best resource-allocation processes not only encourage the flow of information across inter-organizational product development, they also reflect the awareness that choosing the right set of projects (or parts) is more than a financial decision. If projects are connected, the availability of accurate information and the means of communication becomes a crucial factor in making product decisions. Other benefits for companies that achieve these qualities are that the reductions in development lead time translate into less rework and higher quality, and less overhead throughout each step in the design chain. Each step in the design chain has a direct impact on the organizationâs bottom line. For inter- organizational product development, these benefits are jointly shared by all parties within a given design chain. The prior two components (Information Systems and Content Management) are both relatively well understood. Information technologies along the design chain are constantly improving. In addition, new technologies to link the enterprise systems across the design chain are now available. These include but are not limited to the internet at large, WWW, virtual private networks (VPN) and so forth, as well as a plethora of security and security management software. Content management and content exchange strategies are also relatively well understood. We have successfully implemented many cycle-time reduced processes in many different organizations and continue to evolve. However, without a foundation of effective design chain organizational relationships, any efforts to manage the flow of information or product engineering information across the design chain are unlikely to be successful. Of the three primary activities associated with DCM, relationship management is perhaps the most fragile and tenuous, and is therefore, the most susceptible to breakdown. These failures can happen for a multitude of reasons â technically, links can be repaired with relative ease, however, process issues are much harder to solve. To avoid such problems organizations must develop a better understanding of their product development processes as well as their suppliers content delivery, in order to serve the product development organizations in the design chain. To ensure that this occurs, communication links between suppliers and product development groups must be established and utilized on a regular basis. In short, design chain relationships are probably one of the most important management interfaces within the entire design chain. A key element of improved supplier relationships is the presence of an objective performance measurement system, which is used to ensure that both parties are operating according to expectations and are meeting stated objectives. In addition, parties must emphasize clear objectives, expectations, and potential sources of conflict up front in order to facilitate communication and joint problem solving. As a result of this communication, trust between product development organizations and suppliers begins to grow, leading to further improvements. Integrating design chains in product development organizations holds a great appeal to suppliers and developers alike as the difficulty involved implementing this strategy is evident. Integrating the management of information across the design chain offers the benefits of increasing the value added by the design chain members, reducing rework, and reducing cost. However, deploying and managing this strategy is a challenging and significant task. The process of implementing a design chain involves great attention to the information systems, to make sure that the information is available to the people who need it, when they need it. In other cases, the information is available, but design chain members are reluctant to share it due to a lack of trust and a fear that the information will be revealed to competitors. Content management is no less difficult. Although content management systems are continuously improving, the need for late updates will never disappear entirely. There are always delays in updates and changes in part information for a variety of reasons. Slowdowns resulting from breakage in the telecommunications systems, poor communications, and, of course simple human error, are inevitable. With the double-edged sword of more accurate information and increasing demand for improvements in information content and just-in-time delivery, the management of content throughout the design chain becomes an increasingly complex and demanding task. Finally, establishing trust between parties in a design chain is perhaps the greatest challenge. Legal experts may produce reams of contractual agreements that fail to work when parties inevitably have a conflict. Therefore, conflict management in inter-organizational relationships is becoming increasingly more important. Committing a product development organization to design chain requires careful study of all suppliers that âfeedâ into this chain. Any content issues addressed by the manufacturer need to be compatible with the product development environment on the customerâs side. The past decade has seen a rapid decline in the significance of mainframe-based processing in many organizations and a simultaneous increase in importance of client server and LAN-WAN- based computing infrastructures. Although no one expects all mainframe systems to disappear in the near term, the centralized systems model for operations and, therefore protection, has fallen from favor at present. This means the suppliers and customers must now find ways to effectively protect the critical informational content of hundreds or thousands of servers and perhaps tens of thousands of end-user workstations/personal computers. Any of these systems may in fact provide a point of access to critical information stored locally or accessed through networks. The evolution and implementation of the ânetworked computing paradigmâ has been accompanied by the distributed systems and rise of client server-based applications. SUN Microsystems has popularized the slogan âThe network IS the computerâ. If this is true, then information systems have a responsibility to help the organization determine where and what gets protected, and most importantly, by whom. The increasing prevalence of client server applications further challenges and blurs classical accountability. Typical life-cycle-based development checkpoints for information systems auditors and security staff are often overlooked by the information system groups in their rush to meet required delivery dates to support business unit priorities. The absence of rigorous systems development standards are often compounded by a lack of robust tools for ensuring that baseline security measures are implemented. Audit trails and change controls are often limited or lacking and easily bypassed at the serverâs operating system level, and access controls are often limited to little more than fixed passwords. Data warehouses and high-value data bases are often married to internal Web servers in the push to deploy a corporate âintranetâ to facilitate easy access to information by authorized users. However, little or no effort is invested to prevent or detect unauthorized access to sensitive information by the users who may operate worldwide. Access to corporate information has been dramatically increased via the rapid deployment of microcomputers, LANs, WANs, and soon by the next generation of âpersonal digital assistantsâ. Most medium and large organizations are rapidly moving to an information systems distribution environment where critical information pulses through the global network on a 24-hour basis and is accessible by a wide array of devices which may be linked through the Internet or via remote dial- up connections or may employ wireless cellular technologies. The combination of these advanced devices promises to provide access to information unlimited by time, location, or distance. Structuring a program for identifying and safeguarding essential information against the wide array of threats at this level of complexity is substantially more difficult than protecting information safely inside a fixed location. Globalization of operations further compounds the information protection challenge. As business organizations face increased competition from both domestic and foreign rivals the organization often responds by increasing foreign operations itself. Many medium-size organizations now have a presence in many nations â something that in the past was the privilege of the large and sophisticated multinational organizations. Lacking a deep bench of international business experience to draw from, managers of such organizations may make poor decisions which will increase risks to systems and information. âBusiness: Anywhere, Anytime, Anywayâ seems to be the implicit mission of many organizations. The most important fact to emphasize in considering the new risks arising from global operations and associated global networks information systems infrastructure is that the organization truly is âonly as strong as the weakest linkâ whether that is an unlocked file cabinet in Dallas, TX, an unsecured desktop workstation logged on to a corporate system in Munich, or a laptop computer forgotten at an airport. Motives â For each operational region itâs important to understand what causes people to commit unauthorized, possibly illegal activities, as well as what motivates them to comply with management-directed protection methods. Misunderstandings â Itâs very easy for both language and cultural nuances to adversely impact the effectiveness of the protection measures. Management Consistency â It is essential to ensure that a minimum baseline of protection is applied worldwide, but this is very difficult to achieve. Given a wide range of management styles, it is difficult to ensure minimum baseline measures are applied, which complicates efforts to ensure that none of the remote or foreign office locations becomes the weakest link. Every major continent contains a wide array of cultural management styles which impact willingness to deal with forms, procedures, and incidents. Recent technological developments have brought design information to the forefront which forward-thinking firms can use to cultivate genuine competitive advantage. These technologies provide the means for multiple product development organizations to coordinate their activities in an effort to truly manage the design chains. As the rate of these technological advances increases, the cost associated with this information decreases. Simultaneously, the speed with which this vital information can be made useful and applicable in a variety of product development situations continues to increase. Industry observations made in the mid-80âs are still very much valid, and have only increased in urgency: â… managers need to understand that information technology is more that just computers. Today, information technology must be conceived of broadly to encompass the information that businesses create and use as well as a wide spectrum of increasingly convergent and linked technologies that process the information. In addition to computers, then, data recognition equipment, communication technologies, factory automation, and other hardware and services are includedâ. Utilizing this paradigm, the role of information systems in the design chain is very obvious. To date, a significant portion of the information flows between functional areas within an organization and between product development organizations is still paper-based. In many (most) instances, these paper-based transactions and communications are slow, unreliable and error prone. Conducting business in this manner is costly because it decreases the product development organizations effectiveness in being able to design, develop, debug, prototype and so forth. This approach also impedes efforts to develop and capitalize on successful inter-organizational ventures. On a general scale, the importance of information is understood, however, the ability to share and utilize information is difficult. Information systems today may be quite complex and comprehensive, supporting a companyâs communication networks, databases, and operating systems. In fact, âIT infrastructure capabilities underpin the competitive positioning of business initiatives such as cycle-time reduction, implementing redesigned cross-functional processes, utilizing cross-selling opportunities and capturing the channel to the customer.â. These infrastructures also support the product development, management, and maintenance of inter-organizational design chains. The information systems and technologies utilized in these systems represent one of the fundamental elements that âlinkâ the organizations of a design chain into a unified and coordinated system. In the current competitive climate, little doubt remains about the importance of information and information technology to the ultimate success of any restructuring in the product development organizations. Information is a crucial factor in the managersâ abilities to reduce product development time and human resource requirements to a competitive level. Information flows play an essential role in the strategic planning for deployment of resources. Serving the customer in the best, most efficient, and effective manner has become critical, and information about issues such as component part status, product availability, and so forth has become a necessary part of the total customer service experience. A key notion in the essential nature of information systems, as they pertain to product development and maintenance of successful design chains, is the need for virtually seamless bonds within and between organizations. This means creating intra-organizational processes and links to facilitate delivery of seamless information between marketing, development, manufacturing, as well as inter- organizationally, to customers, suppliers, carriers, and distributors across the design chain. Results from this change in perspective require aligning corporate strategies to the information technology paradigm, providing incentives for functions to achieve common goals through the sharing of information, and implementing the technologies to re-design the traditional information transactions to intelligent and directly usable content. Suppliers rushing to market often focus on the user or perceptual aspects of their information systems, such as their appearance, content, and product organization. However, the âback-officeâ subsystems of the information systems â those that provide the link between user experience and the actual physical delivery of component parts to the consumer â continue to be a challenge. Figure 6 shows an example of how component parts and component part documentation relate. Both domains follow more or less well defined life cycles. The life cycles are related, but not initially synchronized. 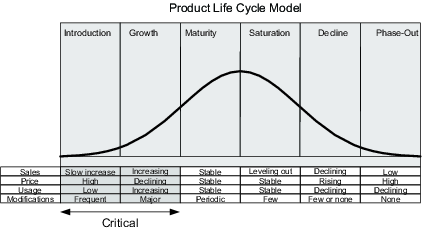 As components are developed and improved, they follow the product life cycle model as shown in Figure 2.3. The initial two phases are the most critical for succeeding with the development of a new product. A series of coordinated steps is required to bridge the gap between a product development engineer browsing an e-commerce site and actually receiving (directly-) usable information. Sharing semantics is one of the fundamental problems a design chain solution has to solve for the data communicated. An XML-based (eXtensible Markup Language) approach to content aggregation lends itself well to the expansion into design chain management exchanges. The main challenge in using XML is not with the document structure and syntax, but with the semantics. Itâs much easier to share syntax than to share semantics. Each application domain needs to have both specific document structure and agreed upon semantics to make effective use of XML-defined documents. Various vertical industry segments have to agree on the meaning of their domain- specific XML tags. Only then can appropriate action be taken upon parsing: translating components into internal business objects for use within the enterprise. Fortunately, several standards are emerging, using XML to describe the types of business documents that need to be exchanged so that trading partners can exchange information and services. Integrating network node, in which the member literally becomes a data-communications/ data processing utility that integrates any number of lower-level participants and applications in real time. A sixth level of participation also appears within the context of the design chain as a design chain network node, in which the participant shares the network of diverse applications with any number of participants with whom it has established a business relationship. This is similar to the network control node mentioned before, but it does not restrict the inter-organizational information system participant to a specific level. Therefore, inter-organizational information system participants can be higher, lower, or equal level than their partners. As product development organizations implement inter-organizational information systems, they will be faced with several challenges. One impediment undoubtedly lies in developing a common language in terms of planning, format, and priority across several vastly different constituencies. Information-sharing requirements are well beyond those of a manufacturer and its distributorâs need to facilitate product development in a consistent way. All relevant information ultimately must circulate to and among all organizations between the design chainâs point of view and its point of consumption, such as search and select, or CAD model creation. The key to building an effective design chain solution lies in assembling the right mix of content, dialog, services, and transaction processing that reflect the target industryâs business practices. âCompanies must leverage Internet and existing IT investments to inter-network the enterprise beyond the corporate fire-wall. By extending the intranet to the customers, suppliers, channel partners, distributors, and remote workers, new types of firms can create a secure, robust, high- function, and reliable base for a new era of e-business, and an e-world.â First and foremost, it is essential that individuals with extensive domain experience should play a central role in specifying the service mix for a given industry segment. Many of the early attempts emerged from existing businesses whose executives had a predisposition to move into building virtual communities online. Regardless of the technology-based approach, all are attempts by businesses to manage activities across company boundaries in a coordinated, integrated fashion. Although the importance of information, and the supporting technology, to design chain management is evident, determining which specific system and application can provide a specific design chain with the greatest benefit is not at all clear. âHow to best extract value from information technology resources is a major challenge facing both business and IT managers, particularly as they turn their focus to searching for competitive benefits of strategic information systems and striving for benefits beyond process re-engineering.â4. This search becomes increasingly complex for those organizations attempting to operate in design chains with multiple participants. Intelligent content is the first step in building a DCM solution. Directly usable information content or re-usable content is the next step to using the intelligent information in a fashion that assists the product development process. Figure 2.4 gives an overview of different aspects of intelligent content required for a electronic system design. Each of the columns connects to a process or processes in the product development environment. For example, schematic symbol data is used in the CAD design process to refer to the logical outline of a particular electronic component. Symbol data that can be used directly in a CAD system closes a well-known problem in the design of electronic systems. 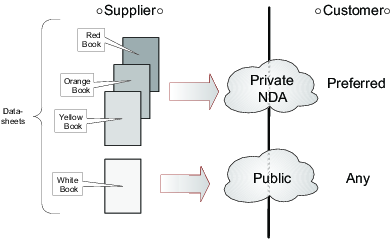 Figure 2.5 shows a design chain setup between a supplier and customer for the exchange of component connection information. The supplier provides intelligent information about his components in the form of component connection information. The customer on the other side will use this information and pass it through a set of transformations that allow the creation of CAD models. These models are directly usable in the particular CAD system. Directly usable content satisfies the customerâs need to create and manage incoming CAD information in a safe and reliable manner while at the same time increasing performance for this task tremendously. On the other side, the supplier provides the information in a CAD agnostic way, and therefore avoids the pitfalls of managing highly tool specific information. As product development organizations grow and change to meet new market challenges, the content associated with a design chain may become âstaleâ in a particular application. Finding new purpose for existing data sets and associating them in particular ways is one of the central aspects of an efficient design chain solution. Accessing the relevant content from the existing data sets and documentation. This can be accomplished by applying data mining technologies to extract content and create exchangeable and reusable information. Applying supplemental information to enhance the content, thereby giving it a new purpose. In some cases, simply extracting the relevant content will enable new purposes for existing information. Numerous services facilitate collaboration in the design chain between suppliers and their customers in product development organizations on day-to-day activities. These services can be categorized as those for collocation, coordination, information sharing, corporate history management, and integration. — Lack of communication among geographically dispersed team members is a major obstacle to cooperative work. Effective communication between team members can be facilitated by enabling them to share applications. Multimedia desktop referencing, like WebEx or Netmeeting, using text, graphics, audio, and video is also needed. — Good coordination is critical for effective functioning of multidisciplinary product development teams. These teams must influence each other so that a high-quality product is produced within a short turnaround. These services provide on-line support for group decision making and negotiating solutions over a geographically dispersed network. In particular, common visibility of activities and data, planning and scheduling of activities, notifying team members of changes and managing constraints across multiple perspectives are some of the needs to be addressed by this service. — Information generated by an enterprise is likely stored in heterogeneous data formats and in various legacy databases scattered across the organization. Information sharing involves developing common data representations and providing transparent access to information in a distributed heterogeneous system. Problems arising from the management of replicated data, version and concurrency control, and change management in distributed databases must be addressed. — In a design chain environment, it is desirable to electronically capture the design intent and evolution of a product from conceptual design to retirement. Corporate history is useful for designing future products and documenting existing ones. Indexing, linking and storing various types of documents (design, manufacturing, specifications, etc. ), as well as archiving decisions reached in meetings among designers are some of the problems that need to be addressed. — This service is the glue that holds all other services together. It also facilitates access to engineering tools and services in a transparent manner across the enterprise. To achieve this end, integration services comprise a number of capabilities. They provide mechanisms to describe what services are available to users and in what form. They also provide mechanisms to exploit the communication infrastructure. Finally, these services provide âwrapper generatorâ tools that encapsulate existing tools and services for use over a network. The information security manager must establish and maintain a security program that ensures three requirements: the confidentiality, integrity, and availability of the companyâs information resources. Some security experts argue that two other requirements may be added to these three: utility and authenticity (i.e., accuracy). In this discussion, however, the usefulness and authenticity of information are addressed within the context of the three basic requirements of security management. Data confidentiality, integrity, and availability are improved because appropriate controls are used for all data across the enterprise. The organization gets the most for its information protection dollar because protection mechanisms are designed and implemented where they are needed most, and less costly controls can be put in place for noncritical information. The quality of decisions is improved because the quality of the data upon which the decisions are made has been improved. The company is provided with a process to review all business functions and informational requirements on a periodic basis to determine priorities and values of critical business functions and data. The implementation of an information security architecture is supported, which better positions the company for future acquisitions and/or mergers. Confidentiality is the protection of information in the system so that unauthorized persons cannot access it. Businesses need to protect proprietary trade secrets from competitors or prevent unauthorized persons from accessing the companyâs sensitive information (e.g., development secrets, legal, or personnel). Confidentiality must be well defined, and procedures for maintaining confidentiality must be carefully implemented, especially for stand-alone computers. A crucial aspect of confidentiality is user identification and authentication. Positive identification of each system user is essential to ensuring the effectiveness of policies that specify who is allowed access to which data items. Integrity is the protection of system data from intentional or accidental unauthorized changes. The challenge of the security program is to ensure that data is maintained in the state that users expect. Although the security program cannot improve the accuracy of data that is put into the system by users, it can help ensure that any changes are intended and correctly applied. An additional element of integrity is the need to protect the process or program used to manipulate the data from unauthorized modification. A critical requirement of both commercial and government data processing is to ensure the integrity of data to prevent fraud and errors. It is imperative, therefore, that no user be able to modify data in a way that might corrupt or lose assets or product development records or render decision-making information unreliable. For example, product development processes that require a high level of integrity include parametric component data, and the associated CAD design information. As with the confidentiality policy, identification and authentication of users are key elements of the information integrity policy. Integrity depends on access controls; therefore, it is necessary to positively and uniquely identify all persons who attempt access. Loss of data processing capabilities as a result of technical failures (systems, networks etc. ), or human actions (accidental corruption of data). Denial of service usually refers to actions that tie up computing services in a way that renders the system unusable by authorized users. For example, a high volume of users accessing a computer system on the network can cause them to be nonresponsive to the requests of users. The loss of data processing capabilities as a result of technical issues or human actions is perhaps more common. Such losses are countered by contingency planning, which helps minimize the time that a data processing capability remains unavailable. Contingency planning â which may involve business resumption planning, alternative-site processing, or simply disaster recovery planning â provides an alternative (backup) means of processing, thereby ensuring availability. In summary, physical, technical, and administrative issues are important aspects of security initiatives that address availability. The physical issues include access controls that prevent unauthorized persons from coming into contact with computing resources, various fire and water control mechanisms, hot and cold sites for use in alternative-site processing, and off-site backup storage facilities. The technical issues include fault-tolerance mechanisms (e.g., hardware redundancy, disk mirroring, and application checkpoint restart), electronic vaulting (i.e., automatic backup to a secure, off-site location), and access control software to prevent unauthorized users from disrupting services. The administrative issues include access control policies, operating procedures, contingency planning, and user training. Although not obviously an important initiative, adequate training of operators, programmers, and security personnel can help avoid many computing stages that result in the loss of availability. The combination of integrity, availability, and confidentiality in appropriate proportions to support the organizationâs goals can provide users with a trustworthy system â that is, users can trust that it will consistently perform according to their expectations. Trustworthiness has a broader definition than security in that it combines security with safety and reliability as well as the protection of privacy (which is already considered to be a part of security). In addition, many of the mechanisms that provide security also make systems more trustworthy in general. These multipurpose safeguards should be exploited to the extent practicable. The critical importance of effectively managing the flow of information across the design chain (see Figure 3.1) has been realized by product development organizations. One of the main promises that DCM holds is the opportunity to improve the flow of information across the design chain while reducing the cost of product development at the same time. The notion of a product development organization, its suppliers, and customers, all working together to meet the needs of the ultimate end customer for the mutual benefit of all parties concerned is a very appealing proposition. However, adopting and implementing a design chain management strategy requires considerable effort and represents a quantum change in direction for many organizations. Prior to embarking into the promising, but largely âunchartedâ world of DCM, it is critically important that product development organizations have a detailed understanding of current design chains and associated processes. This understanding will serve the organization well in its efforts to determine the relative importance of its various design chains and to identify those processes most in need of improvement. The following section describes several tools and techniques that can be employed by product development managers to help them fully understand their organizationsâ design chains. Organizations are simultaneously members of multiple design chains. A product development organization in each chain typically offers a number of products and services, obtains information from a wide range of manufacturers, and connects to multiple customers. From the perspective of the typical product development organization, each of the design chains will have both internal and external âlinkagesâ. However, it is unlikely that all of the product development organizations design chains will be part of formal inter-organizational design chain management initiatives. A product development organization must, therefore, focus its design chain management efforts on those design chains most critical to the organizationâs success. Critical design chains are those that offer the greatest potential for achieving a competitive advantage while providing benefit to the entire product development process. The internal design chain is that portion of a given design chain that occurs within an individual product development organization. Internal design chains can be quite complex. Given the multi- divisional, international organizational structures found in many businesses, it is not uncommon for the internal part of the supply chain to have multiple âlinksâ that span the globe. Developing an understanding of a product development organizationsâ links is often an appropriate starting point for design chain initiatives. Interestingly, in multi-divisional structures, the individual divisions are usually regarded as if they were external suppliers or customers. The division autonomy must be taken in consideration when integrating cross-divisional functions and processes. Development of design chain process maps (typically activity maps3.1) for major design chains and their related processes is a useful technique for establishing an understanding of the internal design chain. 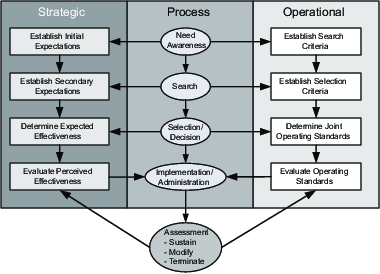 Process map development is best accomplished through the use of cross-functional teams comprised of personnel from all parts of the organization included in the design chain under review. Team members must be knowledgeable regarding their part of the design chain and must also have an understanding of how their part interfaces with the other design chain members. Once an understanding of the internal design chain is gained, it is necessary to extend the analysis to the external portion of the design chain (i.e. key suppliers and customers). This is an important step as significant opportunities for improvements often lie at the interfaces between the various design chain member organizations. This step also adds a greater level of complexity, given that multiple organizations and their representatives are now participating in the analysis. At this point in the analysis, any given organization should focus its efforts on design chains that have the greatest potential for its own improvement. Once the key design chains have been identified, it is also necessary to locate the design chain linkages (suppliers and customers) that are considered most critical to the product development organizationsâ design chain efforts. These key linkages are likely to provide the greatest benefits to the design chain management initiative. Once the external participants have been identified, the development of the external design chain activity map is conducted in the same manner as discussed earlier for the internal design chain. However, the team is now cross-functional and inter-organizational in its composition. This team should include representatives from all functional areas and all member organizations in the design chain under consideration. Gathering this information for internal design chain activities represents a significant undertaking. Obtaining and sharing information with other design chain members represents one of the more significant challenges faced in design chain initiatives. However, if design chains are to be improved, decisions need to be based on objective performance information and will require sharing of this type of information with key design chain members. Organizational willingness to share information with other design chain members is a critical selection criterion for design chain management membership. An organization that is willing to receive information from other design chain members but is reluctant to share information is a poor candidate for inclusion in a design chain management initiative. 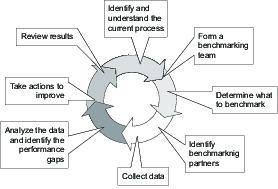 Benchmarking provides a means to focus the design chain management efforts on those areas most in need of improvement (see Figure 3.2). This also will establish a base line for future design chain re-engineering efforts. Product development organizations must recognize that their current processes and practices may not be the best approach within the context of an inter-organizational design chain. Organizations must recognize the pitfalls of sub-optimization (i.e., an incomplete functional or departmental basis) within the context of a single organization. The same logic must now be applied to the design chain to avoid âsub-optimizingâ at the design chain level. This means that the level of analysis for the re-engineering effort is the entire design chain, and it is this larger system that the member organizations must attempt to optimize. Process improvements in the design chain may also significantly reduce the cost of doing business for design chain members. For example, in product development organizations that create consumer electronic systems, such as PCs, reducing the cycle time for creating schematic symbols for the CAD tools can be significant. Typically, this process takes anywhere from 1 to 2 weeks to create a corporate standard symbol for the library. The time it takes heavily depends on the pin count of the component. The cumulative effect of using new components in a design can lead to significant project delays and cost over-runs. The obvious opportunities lie in increasing the likelihood of component re-use while decreasing the additional time required for new components. Traditionally, a pin count of about 100 terminals on a electronic components was relatively large. However, the advancements in miniaturization have enabled manufactures to add more and more functionality into the electronic components. The added functionality in modern components has lead to an explosion in the number of terminals on an electronic component. 400 to 600 (and up to 1000!) connections per component is becoming commonplace. In fact, cycle times to create schematic symbols have become so large in some cases, that customers prefer to reuse existing and presumably inferior components over and over again. The acquisition cost for a new component is therefore avoided or at least significantly delayed. It is evident that a delay in adopting a new component by a customer for a new system design in turn also delays the manufacturers ability to introduce new functionality. Our studies have consistently shown that design chain re-engineering can reduce the cycle time from 1 to 2 weeks to a half day, virtually eliminating the penalty of using new components. Reducing the time required to provide the end-customer with information or services is one of the major forces that is leading product development organizations to participate in design chain management initiatives. Adopting an integrated design chain approach provides the means to make significant reductions in the cycle-time required to move information between design chain members and to the end customer. Time is a highly effective area to focus overall improvements efforts within a product development organization. The opportunity for cycle time improvement is equally prevalent in an inter-organizational design chain environment. Cycle-time is the total elapsed time required to complete a business process. All too often, only a small percentage of the total elapsed time required to complete a process has anything to do with âreal workâ. The rest of the time is typically devoted to a wide range of counterproductive activities and events, all of which take time. Identifying and eliminating these inefficient uses of time represent one of the major design chain management opportunity areas. It is important to remember, that cycle-time reduction is not just about completing a process quickly, meaning speed for the sake of speed; it is concerned with completing the given process efficiently with fewer resources. By focusing on key processes, design chain member organizations can make significant improvements in cycle-time performance. These improvements can provide a source of competitive advantage for the product development organizations. 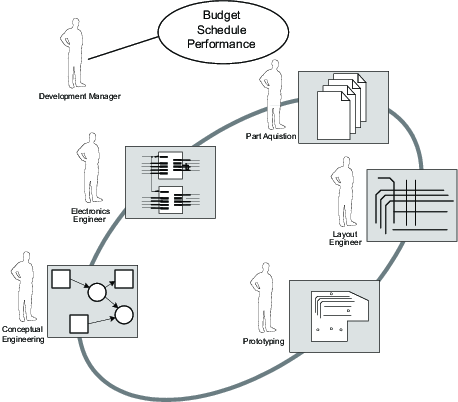 There are a number of causes of excessive process cycle times that can be found in a design chain environment. The following section presents some of the key issues that should be addressed when these situations are encountered. Waiting — In many multistep processes, significantly more time is devoted to waiting between process steps than is spent in all of the processing steps combined! Where are the longest âwaitsâ occurring in the process? What are the causes of these waits? What actions can be taken to reduce or eliminate the time spent waiting? Non-Value-Added Activities — The key processes found in many product development organizations have been in existence for many years. The rationale is often â…because this is how weâve always done it…â. When examining design chain processes, it is worthwhile to determine the value that is being added by the overall process and individual process activities. It is not uncommon to find processes or activities within a process that were essential at an earlier point in time that add little or no value in the current environment. Is this process necessary? Do all activities in the process add value? Those activities that are not adding value should be eliminated. If the process activity is adding value, is it being conducted in the âbestâ way possible given current practices? Repeating Process Activities — A significant cause of poor design chain cycle-time performance is having to repeat process steps due to information or service quality issues. Are there parts of the process that are repeated due to an inability to âget it right the first timeâ? What are the causes of these problems? What actions are necessary to resolve these problems? Poorly Designed Procedures — Do the procedures associated with a specific process lead to the efficient completion of the process? Or do they significantly increase the time required to complete the process by creating more work while adding little value? Outdated Technology — Are the design chain member organizations making the best use of available technology? How is key information communicated across the design chain? Lack of Information — The cycle time for engineers to make decisions in the design chain is often lengthy due to the time needed to gather the information required to make decisions. The required information may originate within the engineersâ organization or in one or more of the design chain member organizations. Do engineers have the information that they need when they need it and in the desired format? How much time is being spent identifying, collecting, and manipulating the information prior to key decisions? Lack of concurrency — Can another task begin before a previous one is finished? Are given tasks really dependent on each other? 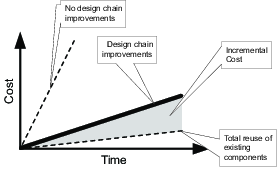 There are many viable approaches to reduce cycle time in the design chain. Specific tools and techniques will depend upon the current state of affairs within the product development organization. The concept of DCM requires measuring overall design chain performance rather than only the performance of the individual chain members. It is the combined performance of the design chain, the final outcome of the efforts of all integrated members, that is of greatest importance from a measurement perspective. Whatever the measurement metrics are chosen, all need to have one central, overriding focus: continual improvement of end-user experience. It is this final user of the design chain that must be satisfied for the overall design chain to be successful in the long-term. These end users care very little about the time required to acquire data from a supplier or about the cost of transforming it into useful information associated with this activity. The end user is concerned with the time required to meet his demands and the cost of doing so. This fundamental concern is reflected most generally in a desire to continually reduce total cycle-time. 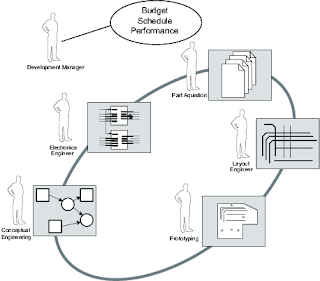 The specific measures necessary to manage design chain performance will vary according to the product development organization, product line, industry, or other factors. However, the importance of maintaining an end-user perspective when developing these measures cannot be overemphasized. Most important is the integration, across the entire channel, of information systems that allows the sharing of information and also facilitates the measurement of performance. In discussing the implementation of a truly integrated design chain, product development organizations are continually faced with the challenge of managing the âpeopleâ part of the equation. As shown in 4.1, relationship management affects all areas of the design chain and has a dramatic impact on performance. In many cases, the information systems and technology required for the design chain management effort are readily available and can be implemented within a relatively short time period. A number of design chain initiatives fail, however, due to poor communication of expectations and the resulting behaviors that occur. It is a major fallacy to assume that managing personal relationships between product development organizations will automatically âfall into placeâ once the information systems are established. The management of interpersonal relationships between the different people in the organizations will more often be the challenging part of the design chain initiatives. Moreover, the single most important ingredient for successful design chain management may well be a trusting relationship between the partners in a design chain, where each party has mutual confidence in the other membersâ capabilities and activities. Without a good relationship, all of the other systems (information systems, design chain tie-inâs etc.) cannot function effectively. 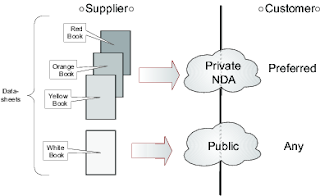 In the early stages of supply chain management, organizations will often eliminate those suppliers or customers that are clearly not suitable, because they do not have the capabilities to serve the product development organization, are too distant, are not well aligned with the company, or are simply not interested in developing a relationship. After these firms are eliminated from consideration, product development organizations may occasionally encounter a design chain member who is willing4.1to put forth a the time and effort required to create a strong relationship. In such cases, product development organizations may consider developing a special type of design chain relationship in which confidential information is shared, assets are invested in joint projects, and significant joint improvements are pursued. These types of inter-organizational relationship are sometimes called strategic alliances. Our definition of a strategic alliance is the willingness of participating product development organizations to modify their business practices in order to reduce duplication and waste while facilitating improved performance. The strategic component examines how strategic expectations and evaluations of alliance effectiveness evolve as an alliance progresses through the development stages. The process component outlines the stages of alliance development that show the required steps for the formation, implementation, and maintenance of an alliance. The operational component positions the development of search and selection criteria and operating standards for managing an alliance. Level 1 — Alliance Conceptualization â begins when a product development organization determines a collaborative arrangement has appeal and provides a potential alternative to the current arrangement. Level 2 — Alliance Pursuance â the decision to form an alliance is finalized, and the firm establishes the strategic and operational considerations that will be used to select the alliance partner. Level 3 — Alliance Confirmation â focuses on partner selection and confirmation. 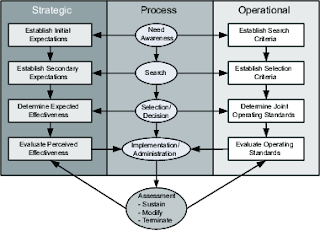 Managers determine the strategic and operational expectations for the arrangement. Level 4 — Alliance Implementation/Continuity â creates a feedback mechanism to administer and assess performance continually to determine whether the alliance will be sustained, modified, or terminated. All contracts, no matter how carefully worded and prepared, can be subject to some form of dispute or disagreement between the parties. Design chain managers must, therefore, attempt to envision the potential for such conflicts and prepare appropriate conflict resolution mechanisms to deal with such problems should they arise. The traditional mechanisms for resolving contract disputes is grounded in commercial law, which provides a legal jurisdiction in which an impartial judge can hear the facts of the case at hand and render a decision in favor of one party or the other. Most organizations will prefer to avoid any lengthy and costly legal battle. Taking a dispute into the court system should be viewed as the last resort, not an automatic step in resolving contractual disputes. Perhaps the simplest method of resolving a contractual disagreement involves straightforward, face-to-face negotiation between the two parties involved. In the alliance model discussed earlier, continuous monitoring of performance and feedback systems in alliance management, prevent problems whenever possible. In some situations, no amount of negotiation produces a solution. When this alternative is exhausted, both parties become aware of the fact that it may be practically infeasible to agree on suitable alternatives. In such cases, it may be virtually impossible for the parties to negotiate an acceptable resolution of the dispute on a good-faith basis without additional assistance from outside parties. In such cases arbitration may be a solution. Arbitration, if set up and handled properly, can serve to protect the interests of both parties to the dispute better because it is relatively inexpensive, less time-consuming, private, and typically a reasonable solution for all involved. Mediation is another form of conflict resolution between two parties. Mediation involves the intervention between conflicting parties to promote reconciliation, settlement, or compromise. Mediation varies from arbitration in that the arbitration is binding on the final decision on the parties. In the mediation process, however, the disputing parties preserve their right of final decision on the solution presented by the mediator. The importance of speed in obtaining a resolution can be a determining factor in the choice of whether to litigate, arbitrate, or mediate. In many instances the alternatives to legal battles in court are quicker than litigation. Time pressure may force the disputing parties to be more creative and understanding in reaching an appropriate resolution short of meeting in court. There is a direct relationship between the time involved in settling a dispute and the cost involved; quicker resolution is generally cheaper. A compelling factor is the âfirst-mover advantageâ. Future success is directly proportional to a product development managersâ ability to recognize changes and respond positively. As noted in the chapter âDesign Chain Relationshipsâ on page , trust is a very fragile element binding organizations in a design chain. Clearly the concept of collaboration and joint competitiveness is often more appealing than âgoing it aloneâ. However, as demands on the design chain continue to escalate, the relationship between product development organizations will be tested. In any design chain, a number of risks exist that must be managed between participating companies. Confidentiality — In order to function, companies in a design chain will need to know more about one another than ever before. To manage the flow of information, product development organizations need to share both strategic-level information (corporate and business unit level), and operational-level information (development schedules etc.). Research and development — As design chain partners work together, sharing new product information will become increasingly important. Moreover, suppliers will bring with them proprietary technologies to be used in their customers products, whereas customers may also jointly develop new products with suppliers and share with them their new product configurations and architectures. Increased service expectations — Most companies today are focusing primarily on the elements of a business transaction that take place at a single point in the design chain. However, future challenges will involve how to manage both the pre-transaction and post- transaction elements. Leverage — As companies continue to merge and acquire one another, power bases will continue to shift. In general this is a good thing; however, how can a less powerful design chain member achieve or maintain a competitive advantage? Mass customization — Customers will also continue to demand increasingly âmass- customizedâ products. This means that although aggregate demand forecasts will remain relatively stable, the number of different products will continue to increase, resulting in a fragmented array of customer options. Shared responsibility — In order to justify design chain investments, product development managers will need to determine who takes on the risk of the investment, and who is entitled to the reward if and when it pays off. What are the critical success factors for managing the global design chain? In a global context, how does crossing international borders influence management decisions in the product development design chain? What are the needs for internationalization and localization for a global design chain? In the face of these problems, developing a global design chain becomes an increasingly complex process fraught with uncertainty and risk. Corporations will need to develop personnel with foreign language, negotiation, and problem-solving skills, who are willing to be assigned to these areas. The lack of collaborative planning between design chain partners is one of the main weaknesses in the design chains. Currently, some tactical requirements may be shared, but there is little collaboration in developing common product development strategies. The result is that decisions are made sequentially, with no joint planning and predictability. These decisions are often mismatched and suboptimal. Sequential decision making does not account for possible variances in the system, which can sometimes be planned for using simulation and âwhat-ifâ analysis. The most important steps in implementing design chain management systems is the need to provide a single point of contact for customer service and information exchange. Although this statement appears obvious, the challenges associated with implementing such a system are significant. Design chain members will increasingly need to improve coordination of information and information sharing through joint development of new products. By joining forces and sharing design information and technology trends, significant synergies can be achieved to create new products that can quickly capture market share. An equally important benefit of this collaboration is the increased standardization and simplification of product designs that can lead to a âdesign for design chainâ approach. Design for design chain extends the concept of âdesign for manufacture-abilityâ, which refers to the process of simplifying product designs to allow easier manufacture and assembly. Design for design chain broadens the scope to the entire flow of information across different design chain entities. An important attribute associated with a productâs design is the actual complexity of the design, with respect to the number of standard parts and components that go into the final product. Such attributes can have a significant impact on a product development organization and overall design chain performance. For instance, in the electronics industry, field programmable gate array (FPGA) integrated circuits can be mass-produced, yet configured by engineers in the field to a customerâs specific application in its product development organization. This avoids having to produce an application specific integrated circuit (ASIC), which would cost much more because of the small batch run. Another related factor affecting product complexity is whether or not a dominant design has evolved over time. In the newly developing markets, a number of product designs frequently are competing to become the industry standar. In the telecommunications industry, for example, thousands of different options are required on telephone switches, and there is no way to reduce these to specific customer demands. Nowhere is this more important than in industries with short product life cycles. Those companies are facing the engineering challenge of developing products that meet customerâs requirements for higher performance (e.g. speed and capacity) and yet consume the same or less energy and space than the existing products. These products must also provide improved quality and shorter development time, all while meeting market-driven cost targets. More demanding performance requirements have driven technological improvements of components used with the products. In seeking to develop products that are easier to manage from a design chain perspective, design chain partners within product development organizations need to push for more product standards. Marianne Broadbent and Peter Weill, Management by Maxim: How Business and IT managers Can Create Infrastructures, Sloan Management Review, Spring 1997, p. 77. Stephanie S. Barrett and Benn Konsynski, Inter-Organization Information Sharing Systems, MIS Quarterly 1982, pp. 74-92. Sarah Cook, Practical Benchmarking: A Managerâs Guide to Creating a Competitive Advantage, London: Kogan Page Limited, 1995, p.13. Michael Hammer and Steven A. Stanton, The Re-engineering Revolution, Harper Business, 1995, p.31. David Teece, Profiting from Technological Innovation: Implications for Integration, Collaboration, Licensing and Public Policy, Research Policy 15 (1986), 285-330. 2004-08-30 by uwe filed under Development, Software.